Maria Tippett & Yousuf Karsh, originally uploaded by johnwmacdonald. With Dr. Maria Tippett (Anansi Press, 2007) at the podium responding audience questions at the Library and Archives Canada in Ottawa, 30 November 2007. 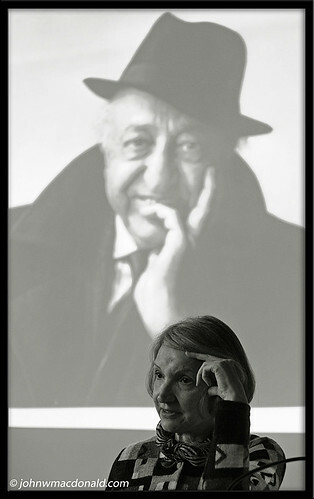 "Yousuf Karsh is acknowledged to be the twentieth century's leading portrait photographer. His iconic images of Bogart, Hemingway, Churchill, the Kennedys, Auden, Castro, Einstein, the Clintons, Khrushchev, Casals, and Elizabeth II inhabit the mind's eye of anyone familiar with photographic history. A refugee from the ethnic cleansing of Turkish Armenians in 1916, Karsh made his home in Boston and Ottawa but travelled the globe during his sixty-year career, photographing political leaders, celebrities, monarchs, and movie stars. He died in 2002, aged 94. He left a legacy of 50,000 portraits.Maria Tippett’s new book, Portrait in Light and Shadow: The Life of Yousuf Karsh, is the first biography, written with help from his family and colleagues and based on the Karsh archive in Ottawa, and reveals the technique behind the camera and the brilliant mastery of the photographer."